If 1971 had been a busy year for Gong (recording three albums), they spent the most of the next year in turmoil and touring with Magma. Drummers came and went, as did most everyone else with the exception of Daevid, Gilli and Didier. Late in 1972, the band attended a Kevin Ayers gig in France, which introduced them to guitarist Steve Hillage. Ex Magma Bassist Francis Moze joined, while Laurie Allen returned long enough to play drums on the album. Tim Blake, an engineer from Allen’s Banana Moon sessions, joined on synthesizer and provided an integral part of the new Gong sound. Gong were one of the first bands offered a new contract with Branson’s new Virgin Records, though legal ties with Byg would dog them for years to come. Re-constituted, Allen penned the first installment of his Radio Gnome trilogy and thus began the Gong mythology. Part religious (think eastern), part mystic and most certainly psychedelic, it became part and parcel of the Gong trip. 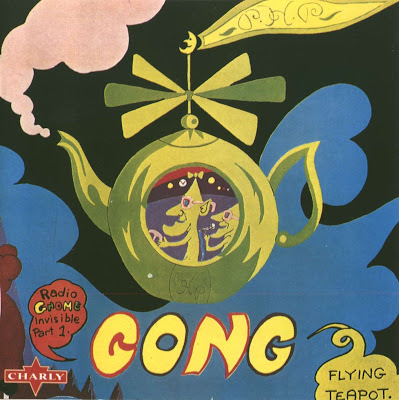 On the surface, the cabaret of "Radio Gnome" is of course plain silly, but the slow rising mantra rhythm of "Flying Teapot" is pure invocation. The opening lines of "The Pot Head Pixies" say it all; Allen’s penchant for writing hilarious lyrics is as natural as his infectious melodies. Blake’s "Octave Doctors" reveals his unique synthesizer talent, as well as Malherbe’s sublime alto sax. "Zero the Hero" broods under the much overlooked rhythm section of Moze and Laurie Allen. Gilli’s Witch song concludes in her own interminable way. All in all, it remains one of the most consistent albums of the trilogy and one of the most original of the era. Daevid and Gilli would take leave for parenthood in Majorca soon after the album was recorded, while further personnel changes would engage the band of the rest of the year. Jazz prog at its zany best. Much obliged Oleg!